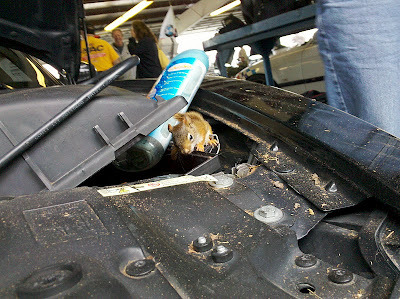 The event chair personally put on a squirrel rescue clinic getting all of the illegal immigrants out of the airbox by their tail and relocating them to a place where they won’t have to experience threshold braking at 140 mph. BMW CCA is rumored to be putting together computer-based squirrel rescue training for other event chairs to follow. 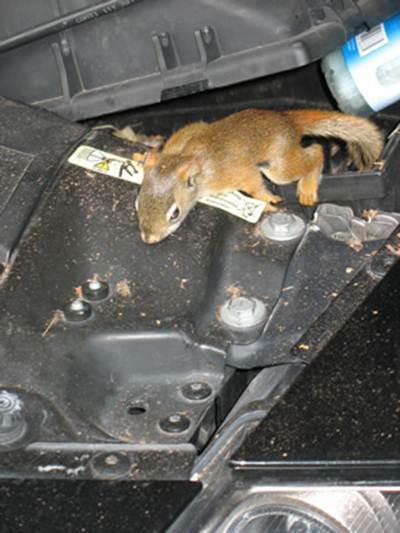 BMW North America is intrigued by the findings and is currently exploring options to replace its famous 6-cylinder inline engines with more eco-friendly 6-squirrels inline. Many animal rights groups have reportedly lined up to sponsor the driver's Team Flying Squirrels in honor of his support with providing luxury housing for the young family of squirrels. Because of the heightened interest in baby squirrels, it is now expected that Hollywood will be replacing Alvin & the Chipmunks with squirrels in its next squeakel. However, rumors that a Canadian goat was also found in the passenger seat of the vehicle and the driver ran over an instructor who tried to steal it and then dragged him all the way from the paddock to Turn 1 have been greatly exaggerated. 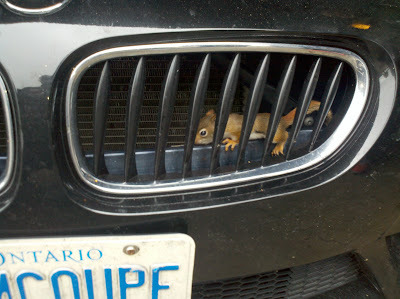 This little guy is the latest member of BMW's Team Flying Squirrels. His dream is to beat the Flying Lizards Porsche team! Sept. 27, 6:30 PM ET UPDATE: An avid OneHotLap reader has provided additional insight into the story. 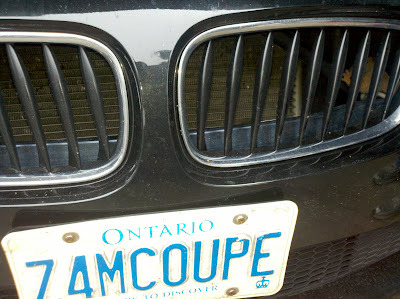 Speed secrets of Canadian Coupe Uncovered! 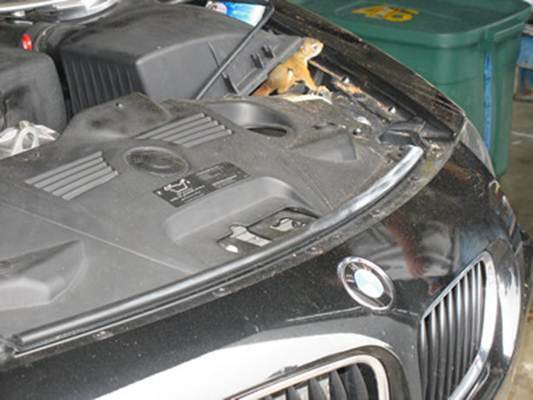 6-Squirrel Air box increases power of BMW Z4 M coupe!! Did the Z4 run better times with or with out the little critters under the hood? 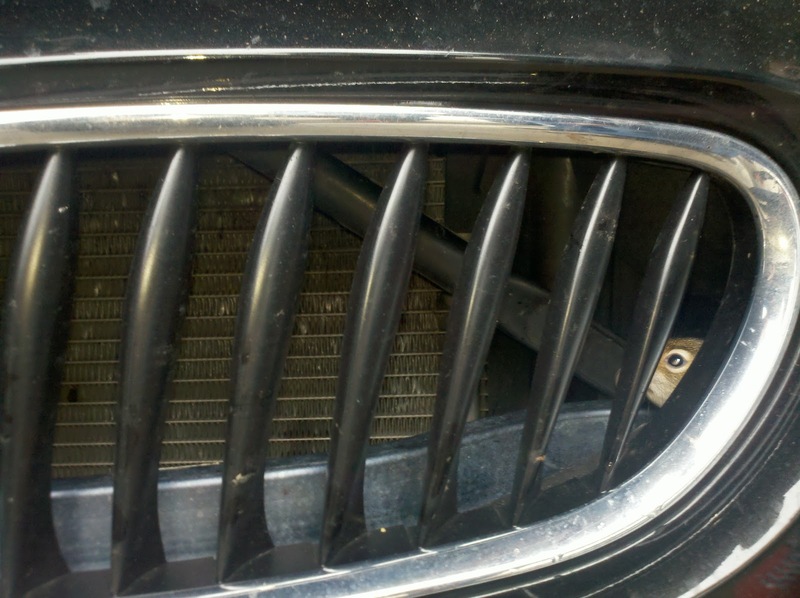 I could just imagine their little faces peering through the grill, what a view of the line. 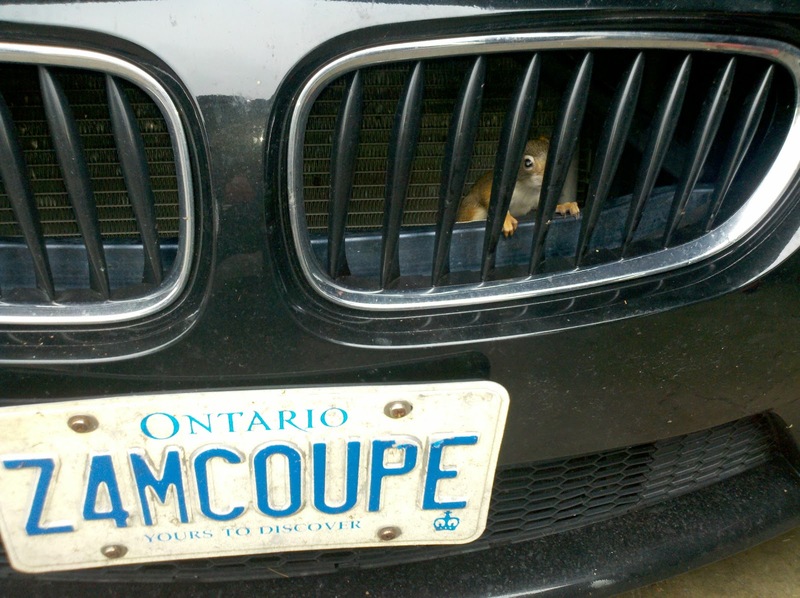 I'll never look at a baby squirrle the same way in my back yard! I'll wonder if that little guy in going hop into my car for a ride to the grocery store for a bag of nuts. 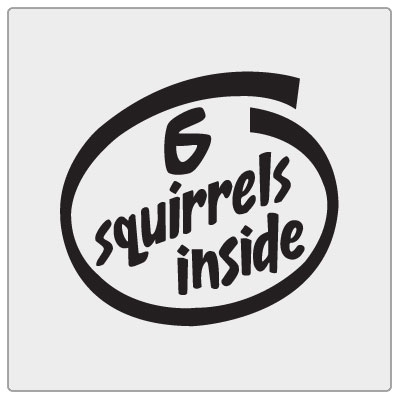 In think I'll put my pre-order in for the in-line Six that runs on nuts. What will they call it, the 6ski's? I regularly find mice nests and even some well dried mice remains in the pre-filter area of the airbox on my 530i. So often that I check it every time I check the oil. 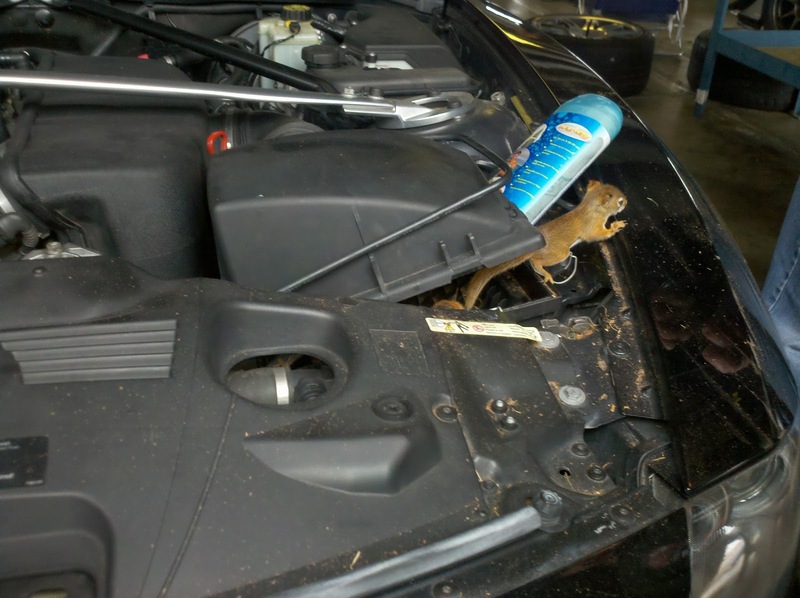 If it is big enough, the idle will surge. Those little guys seem to like to jump up in there from the ground. Hehe driving events are finally getting interesting! These squirrels are so cute. 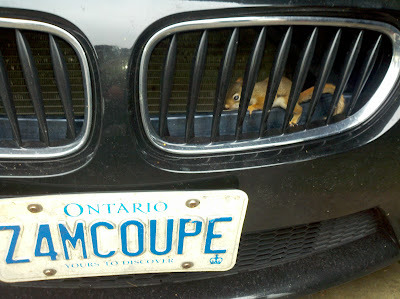 I wished the smuggler would have brought them back to their homeland or we could have adopted them. Plenty of oak trees and American squirrels in our backyard! OMG!!! Poor lil' guys! Does that qualify for a "hybrid" vehicle tax break? Wow, this is amazing. Looks like the squirrel had been there for a while because the air box looks really filthy. Hooniverse.com just linked to the story Here. "BMW Z4M Coupe, Keeps your nuts safe."!! 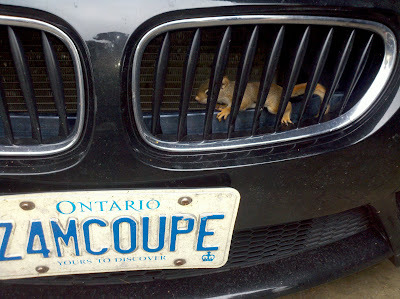 Best alternative title I read on Hooniverse was "Squirrel BM Troubled You". And the Front story in Jalopnik!! Yeah, yeah, it's a warm, fuzzy story... But, a big BUT. Varmits, I tell ya! Vermin! Poop in intakes. Poop in your shed. 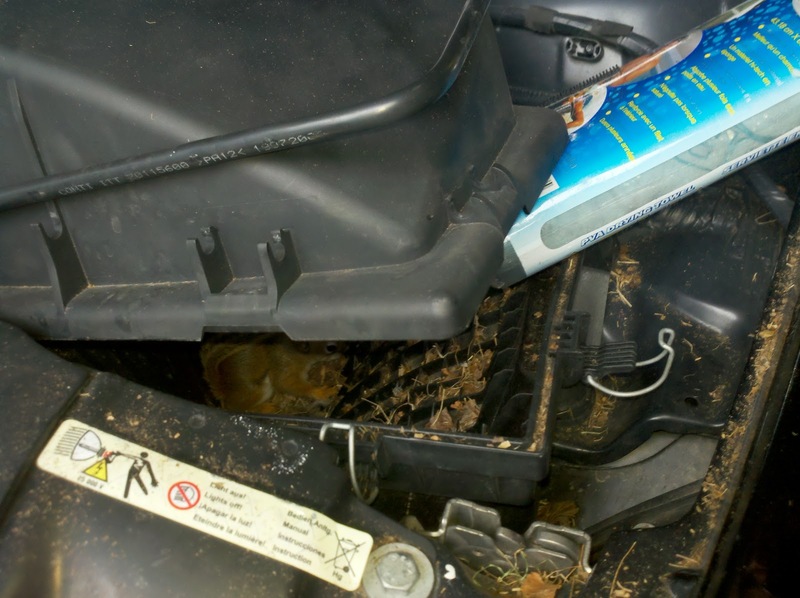 Make nests in your snow blower. They're "tree rats", I tell ya. OK, at least this year they are clearing hickory nuts off my lawn. Amnesty for now. In any case, it was a great write-up. Lots of fun to read. Acorn hole found inside BMW. News at 6 (squirrels). Carl Spackler: License to kill gophers by the government of the United Nations. Man, free to kill gophers at will. 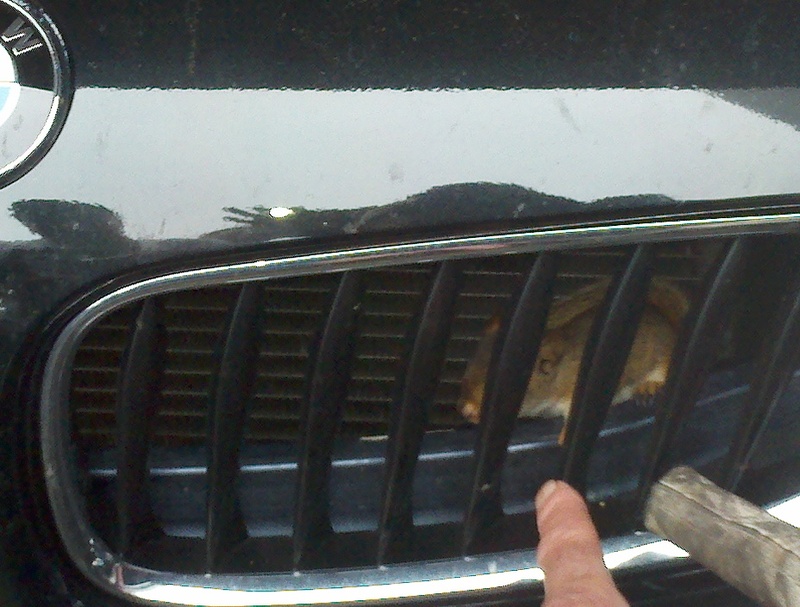 To kill, you must know your enemy, and in this case my enemy is a varmint. 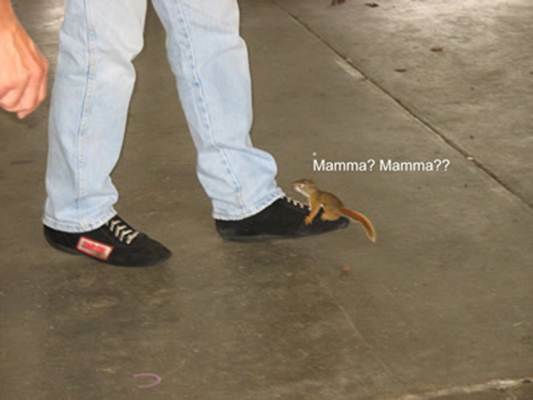 And a varmint will never quit - ever. They're like the Viet Cong - Varmint Cong. So you have to fall back on superior intelligence and superior firepower. And that's all she wrote. Autoevolution linked too, among many other sites. 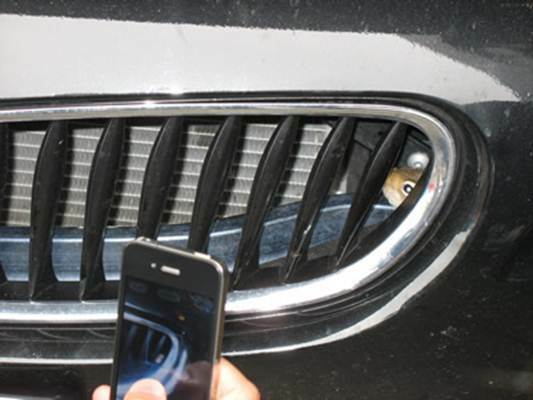 125,000+ hits on Jalopnik alone since they broke out the story 24 hrs ago. 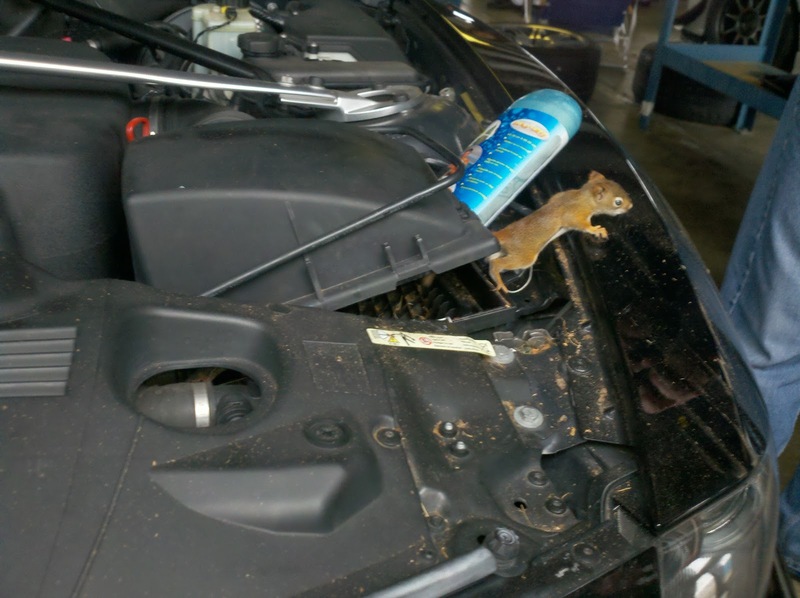 This is NUTS (pun intended)! David David David... Oh the S**T you are going to get next week at O'Fest from us. Your buddies at Odometer Gears Ltd. 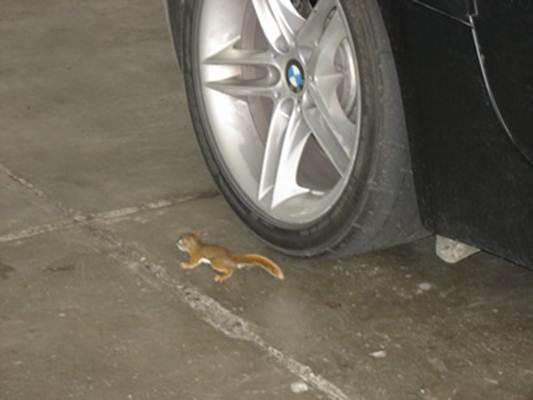 So on the same weekend, after this baby squirrels story broke out, I am driving in the very last session of the weekend - you know, when everybody's packed up for the day and there are maybe 3 cars on the entire track. I am barreling down 142 mph on the back straight at the Glen and ~ 450 ft where I usually brake I see a good size squirrel right smack in the middle of the braking zone. What to do, what to do? I figured I am going straight and hopefully he will just get out of the way and we BOTH live Luckily, he did. I tried pointing it to the corner worker and he was like "What?" So you raise your index fingers above your temples to tell them there is deer on the track, right? What the hell is the corner worker sign for squirrels that are about to be turned into pancakes?! 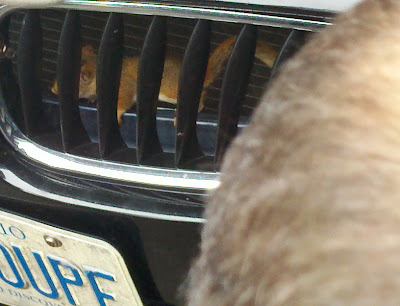 Flying squirrels? Must also trap moose! Where did Natasha go?